A relatively new progressive business group, Business for a Better Portland, continued its rapid growth this week with the launch of a nonprofit. Founded in 2017, the association has swelled to around 300 members. The nonprofit, Friends of Business for a Better Portland, will allow both members and people outside the business community to donate to the organization. The funding will support events aimed at educating business leaders about key policy issues: transportation, housing and equitable economic development. While the association stays away from direct lobbying, its members convene workgroups after some of the events and throw their weight behind political causes. The first big test of their approach came during the recent midterm election, and the organization recorded a win. Its members endorsed Measure 102, an affordable housing bond. The measure passed with strong support from voters. Member businesses Por Que No, Living Room Realty, Above the Fray Design, Nike and Cargo raised money to help defeat Measure 105, which would have repealed Portland’s sanctuary state law. The Democratic supermajority in the state House and Senate, Henry says, will also give the organization a stronger voice on affordable-housing issues and tax reform. The nascent association’s momentum is evidence of an increasing social and environmental consciousness in business. 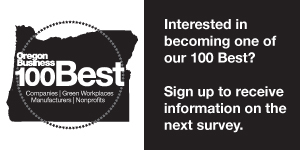 The number of B-Corporations registered in Oregon has jumped over the past year. These businesses advocate for the “triple bottom line” that balances profit with social good. The business community is far from unified on the social advocacy front, however. The state’s conservative business organization, Oregon Business & Industry, strongly opposes cap and trade, for example, while other business groups support it. Other policy issues have seen increasingly fragmented support from businesses. Henry says Business for a Better Portland is building a new coalition of businesses that previously stayed away from politics and advocacy. Most of the companies that are joining did not belong to an existing business organization.